MEMORIAL TO DAD: Three of Ed Kennedy’s sons stand in front of their father’s monument at Monticello HS as they listen to brother Pat (out of the picture) make a few comments. They are, from the left: Michael, Kevin, and Edward Jr.
MONTICELLO — July 4, 2000 -- To have known, worked and played for, or have been taught by Edward R. Kennedy Sr. must have left an imprint, judging by the turnout at the dedication ceremony on Memorial Day weekend at the Monticello high School athletic fields. 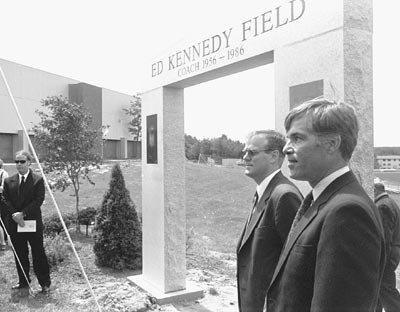 The occasion was the naming of the athletic fields after and unveiling a monument in honor of Kennedy (1931-1998), who served the Monticello School District as teacher, coach, and athletic director from 1956-1986. Armand Seibert, who retired from the Monticello HS phys ed department several years ago, was hired by Kennedy. VanEtten began his speech with a comment that reflected another of his former coach’s qualities — humor. Patrick Kennedy, who followed his father into the education field and now holds the position of athletic director at Middletown HS, spoke for the Kennedy family. “Dad would have been proud of the artistry of this monument,” said Kennedy, a 1979 graduate of Monticello HS. County Clerk George Cooke played basketball and baseball as a freshman for Kennedy in 1956. “He was strong on fundamentals. He cared about what kind of life you lived — on the court and in your life,” Cooke recalled. Mike Bernstein of Monticello was Kennedy’s charge from 1961-65, and played soccer, track, and baseball.